Lately, I have been really fascinated by the various uses of handheld technology in Africa, especially in Kenya — which is well-known for cellphone-based banking. 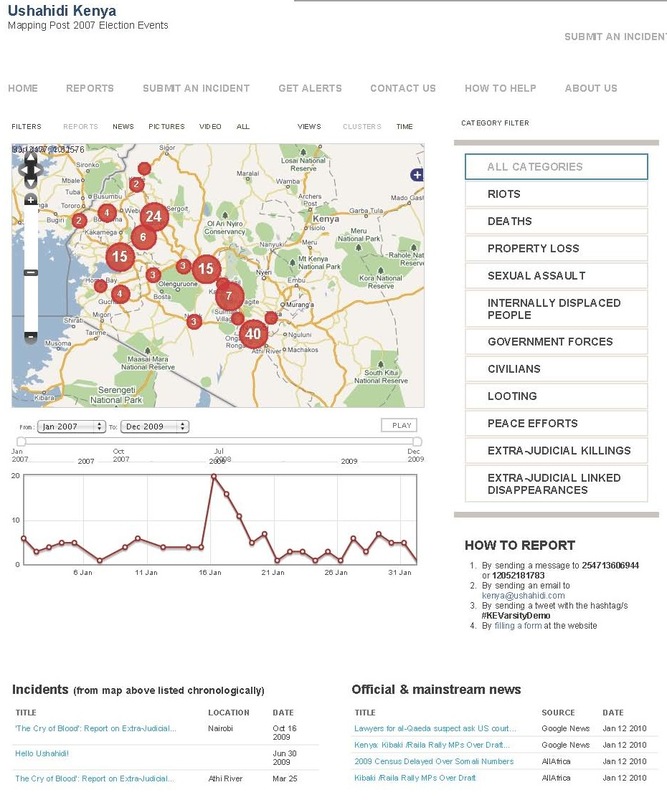 But I just came across this project — maybe I’m the last one to hear about it — called Ushahidi (which means “witness” in Swahili), and they created a “crowdmap” of the ethnic violence that followed the 2007 Kenyan elections. Basically, Kenyans from across the country texted reports of violence from their cellphones or via email, and they created a pretty complete picture of where and on what scale the violence took place (Guardian). Obviously, this is incredibly cool, and very powerful. One of Amartya Sen’s most widely cited observations concerns the ability of democracies to prevent famines from occurring because information and pressure flow freely from citizens to politicians. This type of tool really takes citizen information flow to the next level. I do wonder, however, to what extent such a tool could be manipulated in the future. Is there any way of verifying the accuracy of individual reports?